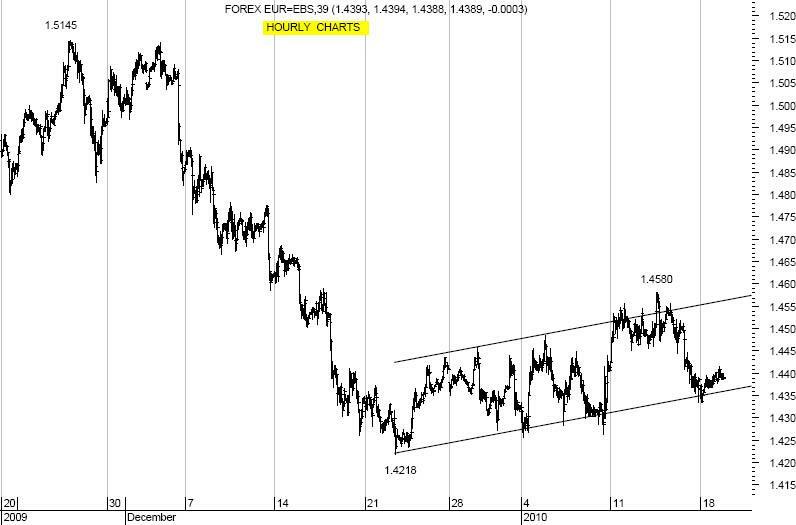 Rebound off 1.4218 in Flag (see graph) and reapproached the neckline of a daily Double Top off (1.4626). Support area at 1.4360 (see graph: Flag bottom), with next levels at 1.4335 (current week low), ahead of 1.4309/ .4303 (daily envelope bottom/ 76.4% 1.4218 to 1.4580), where pause favored. If wrong, next levels at 1.4289 (200 Day Moving Average↑), ahead of 1.4269/ .4257 (daily Bollinger bottom/ Jan 04 low) and 1.4218/ .4210 (reaction low off 1.5145/ weekly envelope bottom): tough on 1st tests; Resistance at 1.4416/ .4425 (broken daily Medium Term Moving Average↑/ daily envelope top), with next levels at 1.4445 (breakdown daily), ahead of 1.4467/ .4471 (breakdown hourly/ weekly envelope top), where pause favored.